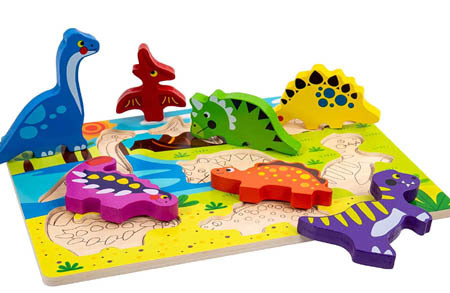 Wooden Chunky Dinosaur Puzzle is a beautiful prehistoric creation with seven colourful dinosaurs and a solid wooden baseboard. This wooden puzzle has fat chunky pieces which can stand up on their own and be played with as separate toys giving more free play possibilities. The base board has simple line drawings in the cut out shapes as a guide to help find the correct place for each dinosaur. This is a very solid toy made from quality wood and fully caveman approved. We like this because: "Simple fun and colourful perfect for the dinosaur obsessed. " All toys are in full use and giving great joy and creative play to the children. Many thanks for the fine service and wonderful quality.